In 1919, a republican form of government regained popularity after the 1918 monarchy escapade. Next year, the country made peace with Soviet Russia. 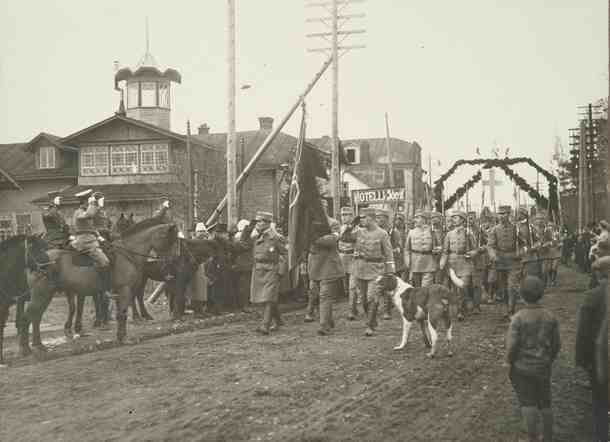 Starting from the autumn of 1918, Red prisoners were gradually released. In 1921, there were some 1,000 of them left in prison. The plans to make Finland a monarchy fell through as Germany suffered defeat in the First World War. The proponents of a republican form of government gained a clear majority in the parliament in the March 1919 elections. However, in the parliamentary reading, the first version of the law did not receive a sufficient majority to be declared urgent. On Heikki Ritavuori’s proposal, the parliament’s right to dismiss the president was removed from the bill, after which it received the necessary additional support from the Coalition Party. The parliament passed the constitution bill on 21 June and declared it urgent. The new constitution still needed to be signed by the State Regent C. G. Mannerheim. A group of right-wing activists tried to prevent it because they feared that the new president would put an end to their plans of invading East Karelia and Petsamo. Mannerheim promised the activists his support if they were able to get the support of the Western Powers and the Coalition Party but, as that did not happen, he ratified the new constitution in July 1919. The new constitution repealed the 1772 constitution and the 1789 Union and Security Act. K. J. Ståhlberg, the first president of the Supreme Administrative Court established in 1918, was elected the first President of the Republic of Finland. In the election carried out by the parliament, Ståhlberg, who had joined the National Progress Party, received 143 votes against State Regent Mannerheim’s 50. Ståhlberg got the votes of the left-wing and centre parties. In the Tartu peace talks between Finland and Soviet Russia, Finland’s territorial requirements covered both Eastern Karelia and Petsamo as well as the Kola peninsula. In the peace treaty, concluded on 14 October 1920, Finland received Petsamo, which had been promised to Finland by Emperor Alexander II in 1864 in exchange for the areas surrounding the Sestroretsk arms factory. The essence of the treaty was that Soviet Russia recognised the historical borders of Finland, which meant the 1812 borders of the autonomous Grand Duchy of Finland. In accordance with the peace treaty, Finland returned to Russia the municipalities of Repola and Porajärvi, which had decided to join Finland. Upset by the treaty, Bobi Sivén, Repola’s temporary police chief, shot himself. For the Academic Karelia Society (AKS), established in 1922, he was a martyr and a hero. AKS sought to create a so-called Greater Finland by joining the Finnic peoples living near the Eastern border to Finland. Finland also stopped supporting the Republic of Kirjasalo, located in Ingria. The far right was disappointed with the outcome of the peace talks. The participation of Finnish volunteers in the revolts of the Finnic peoples in various parts of Soviet Russia continued to cause conflicts between the two countries in the next few years. The idea of a Greater Finland won support especially among the Finnish-speaking university students, which was reflected both in student politics and in national politics. PEACE TREATY BETWEEN THE REPUBLIC OF FINLAND AND THE RUSSIAN SOCIALIST FEDERAL SOVIET REPUBLIC, SIGNED AT DORPAT, OCTOBER 14, 1920. Translation - Translated by the Secretariat of the League of Nations. From the frontier mark No. 90 of Korvatunturi, situated near the lake of Jaurijärvi, to the lake of Ladoga, thence across this lake and along the Carelian Isthmus, following the line of the former frontier between Russia and Finland up to the point where that frontier reaches the Gulf of Finland. The breadth of the territorial waters of the contracting Powers in the Gulf of Finland shall be four nautical miles from the coast, and, in an archipelago, from the last islet or rock above sea-level. From the point where the land frontier between Russia and Finland reaches the Gulf of Finland, to the meridian through the lighthouse of Styrsudd, the breadth of the territorial waters of Finland shall be one nautical mile and a half, and the boundary line of these waters shall, at the commencement, follow the parallel. From a point situated on the, meridian which cuts the southern point of Hogland, the boundary line of the territorial waters of Finland shall follow two straight lines, the first drawn at 61° and the second at 28°, as far as the points where these lines cut the boundary line of four nautical miles constituting the territorial waters of Hogland. Around the islands belonging to Finland, but situated outside Finnish territorial waters, the breadth of. the territorial waters shall be three nautical miles. Latitude 60°00'.5 and Longitude 28°31'.4. » 59°58'.8 » » 28°24'.5. » 59°58'.0 » » 27°55'.0. » 59°54'.6 » » 27°52'.2. Note 1. The boundary lines of all these territorial waters are marked on the Russian maritime maps Nos. 1492 and 1476 annexed to this Treaty1. Should there be a divergence between the maps and the text, the maps will be taken as authentic. 1 Map not reproduced here. To the North-West : the former frontier between Russia and Norway ; Shall, with its territorial waters, as soon as this Treaty shall have come into force, be ceded by Russia to Finland in perpetuity, and placed under the unrestricted sovereignty of the latter. Russia abandons, in favour of Finland, all rights and claims to the above-mentioned territory. Finland guarantees that she will not maintain, in the waters contiguous to her seaboard in the Arctic Ocean, warships or other armed vessels, other than armed vessels of less than one hundred tons displacement, which Finland may keep in these waters, in any number, and of a maximum number of fifteen warships and other armed vessels, each with a maximum displacement of four hundred tons. Finland also guarantees that she will not establish on the coast in question naval ports, bases, or repairing stations of greater size than are necessary for the vessels mentioned in the preceding paragraph and for their armament. The Contracting Powers mutually undertake to grant to the nationals of each other, fishing rights and the right of free navigation for fishing vessels, in the territorial waters along the seaboard ceded to Finland upon the Arctic Ocean and in those to the North and East of the peninsula "des Pêcheurs" (Kalastajasaarento) remaining under the sovereignty of Russia, as far as Cape Scharapoff. Nationals of the two countries shall have the right to land upon the coast mentioned in the preceding paragraph and to construct the buildings necessary for their accommodation and stores, also such other buildings and equipment as may be necessary for fishery and pisciculture. The Contracting Powers undertake to conclude a special Convention, after the coming into force of the present Treaty, with regard to the conditions and regulations to be observed by fishing vessels in the exercise of these fishing and navigation rights in the territorial waters of the coasts mentioned in paragraph 1. The right of free transit to and from Norway through the territory of Petschenga shall be guaranteed to the State of Russia and to its nationals. Goods in transit from Russia to Norway through the territory of Petschenga or from Norway to Russia by the same routes shall not be liable to inspection or control except in so far as may be necessary for the administration of the transit services. These goods shall also be free of customs duties and transit and other dues. Russian nationals proceeding to Norway through the territory of Petschenga and returning from Norway to Russia shall be allowed to pass freely on presentation of a passport issued by the competent Russian authority. Unarmed Russian aeroplanes may fly freely over the territory of Petschenga between Russia and Norway, provided that they observe the general regulations in force. The routes by which passengers and goods may proceed freely from Russia to Norway and vice versa through the territory of Petschenga, and the detailed application of the provisions contained in the preceding paragraphs, as also the organisation and form of the consular representation of Russia in the territory of Petschenga, shall be determined in a special agreement to be drawn up between Finland and Russia after the coming into force of the present Treaty. The inhabitants of the Communes shall be accorded a complete amnesty, as provided in Article 35 of the present Treaty. The local maintenance of order in the territory of the Communes shall be undertaken by a militia organised by the local population for a period of two years, dating from the entry into force of the present Treaty. The inhabitants of these Communes shall be assured of the enjoyment of all their movable property situated in the territory of the Communes, also of the right to dispose and make unrestricted use of the fields which belong to or are, cultivated by them and of all other immovable property in their possession, within the limits of the legislation in force in the Autonomous Territory of Eastern Carelia. All the inhabitants of these Communes shall be free, if they so desire, to leave Russia within a period of one month from the date upon which this Treaty comes into force. Those persons who leave Russia under these conditions shall be entitled to take with them all their personal possessions and shall retain, within the limits of the existing laws in the independent territory of Eastern Carelia, all their rights to any immovable property which they may leave in the territory of these Communes. Citizens of Finland, and Finnish commercial and industrial associations shall be permitted for the duration of one year from the date upon which this Treaty comes into force, to complete in these Communes, the felling of forests to which, they are entitled by contracts signed prior to June 1, 1920, and to take away the wood felled. The Contracting Powers mutually undertake to maintain no military establishments or armaments designed for purposes of offence, upon Ladoga, its banks, the rivers and canals running into Ladoga, nor upon the Neva as far as the Ivanoffski rapids (Ivanovskie porogi). In the above-mentioned waters it shall, however, be permissible to station warships with a maximum displacement of one hundred tons, and provided with guns of a maximum calibre of forty-seven millimetres, and, furthermore, to establish military and naval bases conforming to these restrictions. Should the Gulf of Finland and the Baltic Sea be neutralised, the Contracting Powers mutually undertake to neutralise Ladoga also. The Contracting Powers shall, as soon as the Treaty comes into force, take steps to establish an agreement for the regulation of passport and customs formalities and generally of all traffic on the frontier of the Carelian Isthmus, taking into consideration local conditions and the practical needs of both parties. Traffic in other parts of the frontier between Finland and Russia shall be regulated similarly by special agreements. As soon as this Treaty comes into force, a special mixed Commission shall be appointed to discuss detailed plans of the work in question. The Contracting Powers mutually undertake to open negotiations at the earliest possible date after this Treaty comes into force, with the object of concluding an agreement upon the traffic and rafting of forest products along the waterways which run from the territory of one of the Contracting Powers into the territory of the other. This agreement shall be based upon the principle that the traffic and rafting of forest products in the waterways of this district is permitted by both parties without restriction, both across the frontier and in the territory of the one and of the other Contracting Power, as far as the sea. Similarly, and especially with regard to the rafting, the agreement shall accord to the nationals of the two Contracting Powers the same rights which are accorded to the most favoured raftsman. In addition, the Contracting Powers shall open the necessary negotiations with a view to an agreement guaranteeing the maintenance of the principal channel of the waterways, and dealing with the regulation of fishing and the improvement of pisciculture in the waterways mentioned in the preceding paragraph, and, similarly, in those situated along the common frontier of the Contracting Powers. The Government of Finland undertakes to return to the Russian State, as soon as this Treaty comes into force, a certain number of Russian ships and vessels which are at present within its territory or in its service, and which were left in Finland in 1918. These ships and vessels shall be returned in accordance with the specification annexed to this Treaty. Should claims be put forward by private, individuals, or by commercial or industrial associations, with regard to ships to be restored to Russia, the Russian Government absolves the Finnish Government from all responsibility for their return to Russia, and undertakes to assume responsibility for demands for indemnification which may be presented to the Finnish Government. The Russian Government undertakes to settle the question of the right of ownership to these vessels, and the claims put forward on this matter must therefore be submitted to it. The Russian Government undertakes to restore to their former owners vessels belonging to Finnish nationals or to commercial associations established in Finland, and requisitioned by the Russian Government during the World War without indemnification of their owners, and similarly Finnish vessels which have become the property of the Russian State without indemnification, A list of the vessels mentioned in this Article is given in the Annex to this Treaty [not included here]. The Contracting Powers undertake at the first opportunity to restore the Archives and documents which belong to public authorities and institutions which may be within their respective territories, and which refer entirely or mainly to the other Contracting Power or its history. The Russian Government shall hand over to the Finnish Government copies of the most recent topographical and hydrographical maps of Finnish territory which are in its possession; and also the documents of the unfinished work of triangulation carried out in Finland. Until such time as a Commercial Treaty is concluded, the following temporary provisions shall be observed in commercial relations between Finland and Russia ; these provisions may be denounced by each of the Contracting Powers, always provided that a period of six months shall elapse from the date on which the other Power is informed, before they cease to be operative. Goods in transit intended for transportation across the territories of the Contracting Powers may be transported by all the commercial routes which are or will be open to transit traffic, provided, however, that the regulations for the organisation of traffic and the capacity of means of communication are observed, as also regulations intended to reserve the means of transport required by the country itself, and to ensure public safety. Freight and other expenses charged for goods in transit on the railways or vessels belonging to the State shall not be higher than the charges upon goods of the same nature transported in their own country. For all other expenses which these goods may incur, the principle of the Most Favoured Nation shall be applied. For goods sent from one country into the other, it shall be forbidden to charge higher freight or other expenses than those fixed for the transport of similar goods in their own country. The promulgation of prohibitions upon importation, exportation and transit is only permissible by either party in cases where such prohibitions are based upon legislation with regard to public safety, public health, alcoholic products and the regulation of commerce and all the other branches of economic and industrial activity of the country in question. The Contracting Powers reserve to themselves the right of exercising a monopoly over various branches of commerce and industry. Passenger and cargo boats belonging to one or the other of the Contracting Powers are entitled to call at every port and make use of their facilities and to navigate the territorial waters, lakes, rivers and canals of the other Contracting Power for as long as these waterways are or shall in future be open to the vessels of this Power, and provided that the regulations on national vessels which are in force in each country or which shall be promulgated, and the provisions regarding public safety and the control of customs, are observed. Natural, domestic and industrial products of Finland shall, on their entry into Russia, be freed from all customs duty and other import duties. Finnish Nationals resident in Russia and Russian Nationals resident in Finland shall after,this, Treaty has, come into force, be permitted to return to their country with the exception of persons detained in one or other country for serious offences. Prisoners of War of the two Contracting Powers shall be repatriated as soon as possible. The Contracting Powers shall settle the manner in which this repatriation is to be carried out by a special Convention. All other Nationals of either Power detained in the territory of the other in consequence of the State of War or other political reasons shall be forthwith set at liberty and repatriated. All Finnish or Russian Nationals who have been condemned either for political offences committed before the signature of the present Treaty in the interests of the other State, or for communication with the troops or authorities of the other Contracting State, or for an offence committed with the intention of giving effect to national right of self determination, shall have any further punishment remitted and shall be forthwith set at liberty. Should the person concerned have been accused of or detained for a crime of this nature, and should sentence not yet have been pronounced or the prosecution not yet prepared; the right of prosecution lapses whether the person concerned is within his own country or outside its frontiers. No subsequent prosecution on these grounds shall be admissible. (L. S.) P. M. KERGENTZEFF. The ships and vessels due to Russia, Finland undertakes to deliver in the ports of Helsingfors, Viborg, and Sordavala. The ships and vessels due to Finland, Russia undertakes to deliver in the ports of Petrograd and Cronstadt. Should one of the Contracting Powers demand that the other Power transport, on its own responsibility, into the territorial waters of the former Power, the ships and vessels which are to be returned, the latter Power shall be authorised to do so, provided that it pays the freight, insurance, and other expenses. The other Power undertakes to comply with a request of this nature. The return of the vessels, and all other details, shall be arranged by a joint Finnish-Russian commission. Secretary of the Finnish Peace Delegation. Secretary of the Russian Peace Delegation. DECLARATION. INSERTED IN THE PROCèS-VERBAL BY THE FINNISH AND RUSSIAN PEACE DELEGATIONS AT DORPAT, OCTOBER 14TH, 1920, AT THE MEETING FOR THE SIGNATURE OF THE TREATY OF PEACE BETWEEN THE REPUBLIC OF FINLAND AND THE SOCIALIST FEDERAL REPUBLIC OF THE RUSSIAN SOVIETS. Declaration of the Russian Delegation with regard to the Autonomy of Eastern Carelia. (1) The Carelian population of the Governments of Archangel and Olonetz (Aunus) shall enjoy the right of self-determination. (2) That part of Eastern Carelia which is inhabited by the said population shall constitute so far as its internal affairs are concerned, an autonomous territory united to Russia on a federal basis. (3) The affairs of this district shall be dealt with by national representatives elected by the local population, and having the right to levy taxes for the needs of the territory, to issue edicts and regulations with regard to local needs, and to regulate internal administration. (4) The local native language shall be used in matters of administration, legislation arid public education. (5) The autonomous territory of Eastern Carelia shall have the right to regulate its economic life in accordance with its local needs, and in accordance with the general economic organisation of the Republic. (6)In connection with the reorganisation of the military defensive forces of the Russian Republic, there shall be organised in the autonomous territory of Eastern Carelia a militia system, having as its object the suppression of the permanent army and the creation in its place of a national militia for local defence. Declaration of the Russian Delegation concerning the position of the Population of Russian Ingria. Declaration of the Russian Delegation with regard to an Amnesty for War Refugees. Declaration by the Russian Delegation with regard to the Parishes of Repola and Porajärvi. Declaration by the Finnish Delegation regarding the Property and Debts in Russia of Finnish Subjects, commercial Companies and other Associations and Institutions, and also concerning the appointment of Military and Naval Attachés. In accordance with Article 38 of the Treaty of Peace, the President of the Finnish Republic instructed M. Väinö Voionmaa; Professor of the University of Helsingfors, to sign the French text of the said Treaty on behalf of MM. J. K. Paasikivi, J. H. Vennola, Alexander Frey, L. R. Walden, Väinö Tanner, and Väinö Kivilinna. After the full powers conferred upon M. Voionmaa had been presented to citizens J. A. Berzine, P. M. Kergentzeff and N. S. Tikhmeneff, duly authorised by the Government of the Socialist Federal Soviet Republic of Russia to sign the Treaty of Peace between Finland and Russia, as well as all relevant Acts, found in good and true form, the above-mentioned Delegates thereupon proceeded to the signing of the French text. In witness whereof the present procès-verbal was drawn up to which the undersigned have affixed their signatures and seals. Done in duplicate, at Moscow, on December thirty-first, nineteen hundred and twenty. The undersigned, duly authorised by their Governments, met together to-day at the People's Commissariat for Foreign Affairs in order to carry out the exchange of the instruments of ratification of the Treaty of Peace concluded between Finland and Russia, at Dorpat, on October 14th, 1920. The instruments of ratification having been presented and found entirely correct and in conformity with the originals, the exchange of these instruments took place according to custom, and the entry into force of the Treaty was placed on record. In witness whereof the undersigned drew up this procès-verbal in duplicate, signed it, and affixed their seals thereto. Done at Moscow, on December thirty-first, nineteen hundred and twenty. In 1918–1922, Finnish volunteers participated in the efforts of Finnic peoples to break away from Russia. These conflicts, called in Finnish “heimosodat” (literally translated "Kinship Wars"), took place in Viena (1918), Aunus (1919) and Petsamo (1918 and 1920). Closely related to the Finnic wars was the involvement of Finnish volunteers in the Estonian War of Independence (1918–1920). Finland also supported the uprisings in Ingria (1919) and East Karelia (1921–1922). These expeditions were closely linked to the idea of Greater Finland, which gained momentum as Finland became independent. Some 9,900 Finns participated in the Kinship Wars, and 660 of them were killed. Finnish Reds, who had fled Finland, took part in the fighting on the Soviet government’s side. With the Soviet regime stabilising and the uprisings quelled, close to 20,000 Ingrian and East Karelian refugees arrived in Finland. In addition, opponents of the Bolshevik regime fled to Finland in the early 1920s. In 1922, there were more than 40,000 refugees from Soviet Russia in Finland. The border between Finland and its eastern neighbour, which in 1922 changed its name to Soviet Union, remained restless for a long time. Spies and organisers of underground political activity crossed the border regularly in both directions. Finland was one of the main bases of Russian emigrants who sought to overthrow the Soviet system. Finnish internal affairs, on the other hand, were targeted by the underground subversive activities led by the Communist Party of Finland (SKP), founded in Moscow in 1918. By 1922, some 42,000 refugees had arrived in Finland, including about 25,000 Ingrians and East-Karelians, the remaining 17,000 being Russians. About half of them, 8,000, were Kronstadt refugees who had revolted against Soviet Russia. They had fled across the ice-covered sea and arrived in Terijoki in early spring 1921. By 1929, almost 25,000 refugees had either returned to the Soviet Union or continued to Central Europe. Nearly 14,000 of the Finnic refugees (Ingrians, East-Karelians, etc.) returned voluntarily. A little over 11,000 of the Russian refugees continued westward. About 5,000–6,000 Russian emigrants and about 11,000 Finnic refugees remained in Finland. Late 1922, the refugees were issued so-called Nansen passports. The creation of the system was led by Fridtjof Nansen, High Commissioner for Refugees for the League of Nations. The Russian Empire no longer existed, and Soviet Russia did not want to accept the emigrants as its citizens without thorough investigations. In the absence of travel documents (passports and visas), the emigrants were not able to continue their journey but were stuck in the neighbouring countries of Soviet Russia. At the beginning of July 1922, the League of Nations Commission for Refugees convened an Intergovernmental Conference in Geneva to agree on temporary passports and other travel rules for the Russian refugees. The convention on the “identity certificates” of refugees, or the so-called Nansen passports, was signed on 5 July 1922, and Finland joined it on 1 October 1922. The Nansen passport was intended as a temporary arrangement, but it became permanent when Soviet Russia did not fall. Russian emigrants’ position in Finland in the 1920s and 1930s was by no means enviable. Many of them lived in poverty and had to seek help from the state and local authorities. The general attitude towards the emigrants was unwelcoming. The negative attitude was largely based on the Russification experiences during the final years of Russian rule and the role of Bolsheviks as promoters of world revolution.